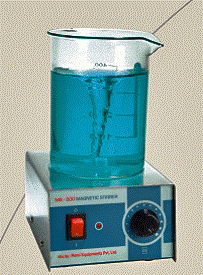 The stainless steel top housing series of magnetic stirrers are most compact models. PMDC motor gives high torque even at lower speeds and maintains speed stability despite viscosity or volume changes. Accurate stepless speed control allows smooth variation up to 1200 rpm. Stirring is accomplished by a small Teflon coated magnetic paddle to be placed in the container.